Wash the cauliflower florets well. Take 4 to 5 cups of water in a vessel. Add a tea spoon of salt. 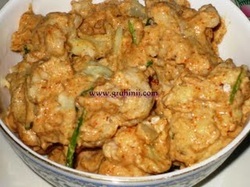 Now put the cauliflower florets in the water and semi-boil them for few minutes. Drain the water. Take a large bowl. In it mix maida, corn flour, salt, red chilli powder, white pepper powder, ginger garlic, lemon juice, soy sauce, and ajinomoto well. Make a thick paste with out any lumps. Now add cauliflower florets to it and toss in to coat it with the paste. Leave it for 4 to 5 mins. 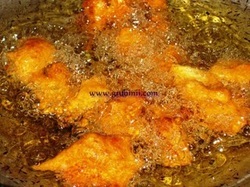 Heat oil in a pan and deep fry the cauliflower florets until golden color. Drain on a a paper towel and keep it aside. Now heat 2 table spoons of oil in a pan. 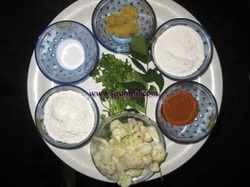 Fry curry leaves and chopped garlic and keep them aside. To the same oil add finely sliced onions, chopped capsicum, green chilli and fry until the onions turn pink. Add soy sauce, tomato ketchup, chilli garlic sauce and salt. Cook for few sec. and add the fried cauliflower to it. Mix well and cook until the curry becomes dry. Now add fried curry leaves and garlic to it. Stir and take it into a serving bowl and garnish with fresh coriander leaves. 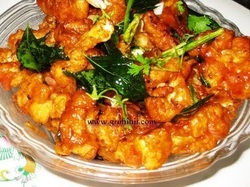 Dry Gobi Manchuria is ready. Enjoy ! !